Surfing the Indian food blogs has opened up new frontiers within the realm of Indian cuisine for me. I get a virtual treat through posts that are beautifully engineered with delectable presentations and I also have new recipes to try out. One such recipe was Marag from Nabeela of Trial and Error. Visitors with vegetarian preferences followed by a much needed vacation for me, kept me from trying Nabeela's Marag. It was, however, the first real meal I cooked on our return. I did put my own spin on it, of course. What is a recipe without one's own special touch? I do have an admiring audience at home, whose expectations must be met in order to maintain my reputation! 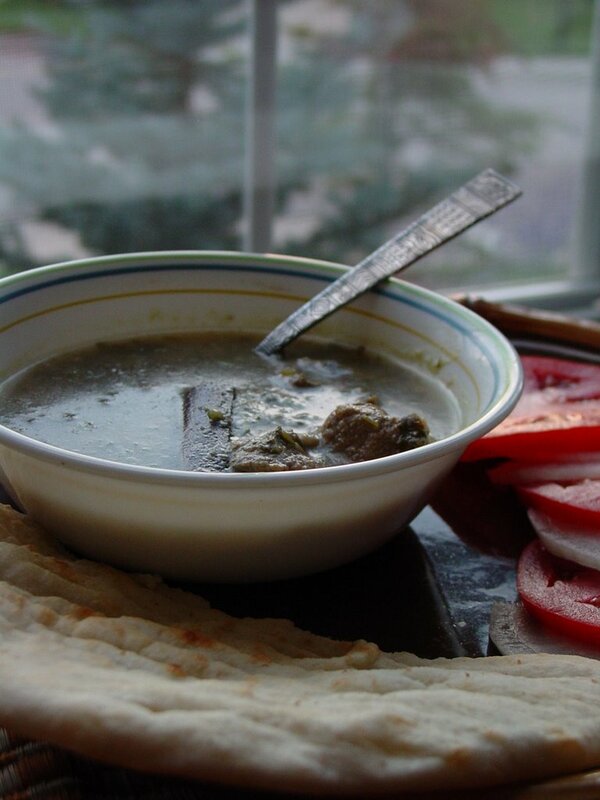 Marag is not a misspelling of murg; it is an Arabic term for a spicy stew or curry. It could be tomato based and have a medley of vegetables in it. Nabeela's recipe is the Hyderabadi version of Lamb Marag. It is usually made with lamb meat for stew. Interestingly enough, marag is also a Gaelic term for blood pudding! I am not sure how I feel about blood pudding but one thing is for sure, the marag I made was simply out-of-this-world delicious! I tripled Nabeela's recipe as I had about 3 lbs of boneless lamb. Nabeela's recipe calls for most of the cooking in a pressure cooker, with some cooking in the microwave. I made mine in a slow cooker. The list of ingredients appears daunting but it's a really easy recipe to follow and make. Heat the olive oil and ghee in a saucepan. Add all the whole spices and cook on medium heat until the spices release a heavenly aroma. Do not let the whole spices turn dark in color or burn. Dice the onion and blend it in a blender to a fine paste. Add this onion paste to the oil and spices. Add the ginger and garlic pastes and saute on high for about 5 minutes. Transfer this to the slow cooker and add the meat and yogurt. Blend the green chillies well in about 1 cup of water. Strain this mixture, reserve the chilli water and discard the residue. Add this to the slow cooker. Add the finely chopped cilantro. Add the garam masala and salt. Mix well. Slow cook on High for 1 hour, followed by 2 hours on Low. Do a taste test to see if you like it soupy or with a thick sauce. I loved the flavors so much that I could see myself slurping on the sauce. So I added 2 cups of water to make it more soupy. Adjust for salt if you do what I did. 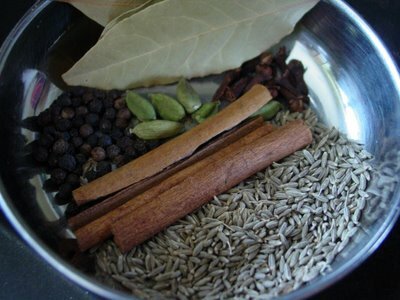 Add freshly ground black pepper just before serving with hot naan or toasted sourdough bread. This is my new comfort food! It's easy to make! It's hearty, spicy and delicious! Never before have we consumed 3 lbs of lamb within a week. Last week, we had marag for at least 3 meals and quite honestly, I could have had it for a few more, too! This recipe is a keeper and it's something I will be making on a regular basis, especially in the cold autumn days. I have a slowcooker and never been used once. 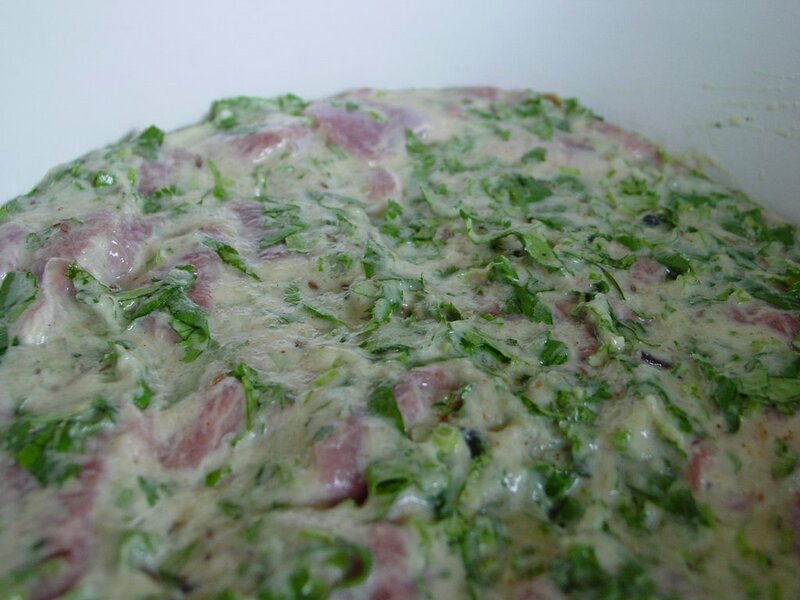 Will put to use with your recipe..
Revathi, you must try this recipe! I am totally blown away by it. Lamb and chicken curry spell comfort food for me. Before I found Marag on Nabeela's blog, I would make a spicy lamb curry as my comfort food. I chanced upon the FMR event after I posted and since the theme fit in so well with how I feel about this recipe, I sent it along as an entry! I hope Nabeela doesn't mind! I love Hyderabadi marag! Manisha: I'm glad you liked the marag so much. I generally make it with 2 lb lamb meat too. And I have no problem with you sending my recipe onto the FMR event...I'm happy hyderabadi food is being popularised. oh! forgot to add....it looks exactly the way mine turns out! Good job! Normally I freeze at least 2 lbs of the 3 lbs I cook. This time it was clear that there was no way that was going to happen! It was so good! Medha needed an extra dollop of yogurt in her bowl of marag but she enjoyed it, too! I am very picky about trimming the fat off the lamb. So there really was no fat floating on the top; which makes this dish an even greater hit! I bought a slow cooker (The West Bend Versatility cooker--which is wonderful as you can fry seasonings, etc... in the pot on stove, then place it on its base for the slow cooking.) and made the Marag. It was delicious. My husband loved it as well. He was skeptical, having looked at it very early in the cooking when it wasn't particularly attractive. I reduced the oil to only one tablespoon of canola oil (no ghee), and was extremely vigilant about trimming the lamb; still, he thought it tasted very rich. Thanks for the recipe Manisha. simsim, I'm so glad you liked my slow cooker version of Nabeela's original recipe. Well, marag is definitely rich in flavor, which is what we want, right? :-D So mission accomplished! Yay! I'm going to make marag again tonight. I don't mind using olive oil or the ghee - we hardly eat any ghee so 3 tbsp for 3 lbs of lamb is fine by me. It really does enhance the taste, as Nabeela has mentioned in her post on marag. Visit our new web 2.0 blog, and leave your comments, pl. Manisha and Nabella, thanks to both of you. Absolutely wonderful - such complexity of flavor and spice. I also trimmed nearly all of the fat, so no degreasing was needed. I make some very basic Indian meals, but this was my first attempt at something more advanced. Thanks for taking the time to share your knowledge. I am looking forward to exploring and preparing the dishes on your blogs as well as the others you recommend. Being of Mexican descent, the range of spices and the use of chiles is familiar, yet diverse. Muy sabroso (very delicious). vnaxera, welcome to IFR! I am so glad you liked Hyderabadi Marag and that the long list of ingredients did not faze you! Once you get a handle on the spices, the rest of the dish is a breeze! I am sure Nabeela will appreciate your compliments, too! You are right about how the range of spices and chiles is familiar yet diverse, between Mexican and Indian cooking. Every day I find out about a new type of chile! Incidentally, I am looking for a recipe for mole so if you know of any tested true recipe, please let me know! So far the best mole ai have had has been in Manitou Springs (near Colorado Springs) in a restaurant called The Loop. I was googling for something and found your post about marag. Very interesting, I did not about marag before today. I can't wait to try this recipe in my slow cooker, which by the way, I have never ever used!! Can chicken be substituted for lamb? Farid, thanks for that info! Welcome to IFR! Meera, I don't see why not. The flavor will be slightly different but I am sure it will be delicious! If you can get hold of mutton, perhaps you may want to try that, too. 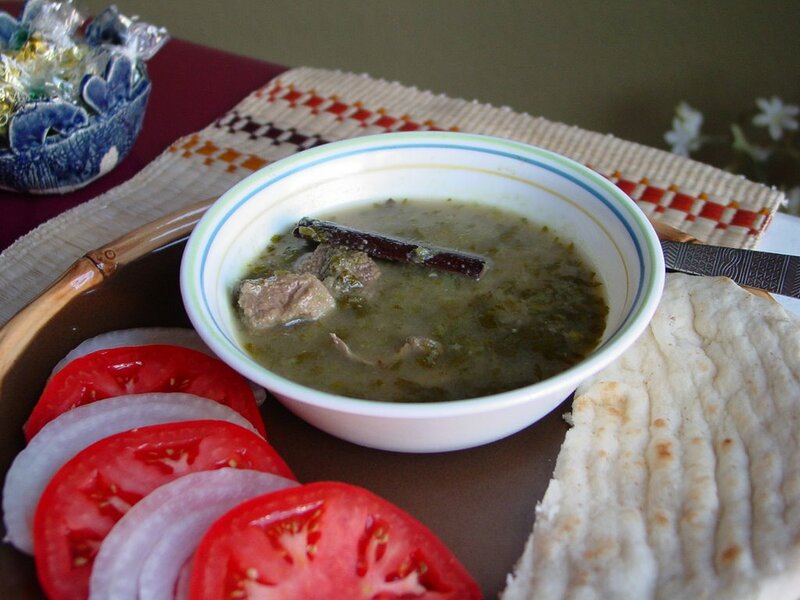 I made this Marag yesterday with Chicken in my slow cooker. It was delicious! I can imagine goatmeat may taste even better. But I enjoyed chicken too. A comfort food indeed. & finally I used that slow cooker of mine. Thinking of making rajama in it too. Thanks for posting Marag in slow cooker. Now I am off to Nabila's to thank her and Sandeepa too because her recent post reminded me. Meera, I am thrilled to hear that! Rajma should be good, too! Are you planning to use canned red kidney beans or cook the rajma before adding to the slow cooker? I haven't cooked beans directly in the slow cooker as that will not be very energy efficient either. And do let Nabeela know what a fab recipe she unleashed when she first posted her marag recipe. And to Sandeepa for reminding us all what a great treat it is! Thanks for a great recipe, can't wait to try it. If you are planning to make kidney beans in a slow cooker, you should cook it normally for at least ten minutes to make sure its toxins are removed. You run the risk of food poisoning otherwise. Jay, I hope you liked the flavors when you made it! More tips and info about red kidney beans can be found here. Sadiya, I'm sorry I missed your comment earlier. The original recipe was made using a pressure cooker. Unfortunately, Nabeela's blog is now a private blog so I cannot confirm this but here's what I remember: put everything in the pressure cooker instead of the slow cooker and cook for about half an hour or until the meat is tender. Faraz, gate crasher? That's an interesting term. Different opinions and variations in recipes are always welcome on IFR as long as we are all being cordial and congenial. Regardless of what I say on Anita's blog, "definitely not" is not a phrase in my vocabulary especially when it comes to recipes. Recipes evolve over time. There are regional and cultural nuances that need to be taken into account. And, believe it or not, environmental and economical values, too. If you read history of Indian food, you can see how so much that is taken for granted today or is "rooted in tradition" actually evolved over a period of time. Additionally, as we all know: a homemade version is always different from the version one would eat at weddings and large events; healthier, too. Having said that, I would love to see your recipe and try it, too! So can I look forward to your post soon? Well Said, Manisha. It is great to see variations of the same basic recipe. Looking forward to trying out this dish. Faraz, please post your version as well. ok..srry couldnt reply soon..and boy dont u guys stand up for ur recipes...hehe..ok 'nother way to cook this...since N's recipe is quite alright save for few details, I ill just mention what i know should be diff. 1.The meat u use should be bone-in, u can trim the fat but meat on bone. add after u add meat and no yogurt ..use light cream just 4-6 spoons r enuff..
Faraz, variations are always welcome! Ignore Anita and my reply to her. I don't get bone-in lamb easily, unless I buy the more (very) expensive ribs or lamb chops. I am planning to make marag tonight and will incorporate some of your changes. Sliced onions take longer to cook than the paste but I will slice them tonight. I will also use almonds - don't have pistaschios handy - but will stick with yogurt instead of cream. As for putting your work aside for this :-D thank you! It's marag. It demands such attention! I have never ever tried lamb. I dont eat it cos of its smell which is real horrific for me. The recipe and the photos look awesome. But I am not still satisfied with how will ti taste. How will taste for t ones who hate lamb? ALso, can I use regular cooker / pot for this sicne I dont have a slow cooker.? I cant see Nabeela's blog though!! Sounds divine. Can you suggest a vegetarian version for this recipe? You mention tomato base and vegetables but do we substitute tomatoes for anything or add them in here? Omar, you could make it with goat meat or beef, if you eat those meats. Nabeela's recipe was made in the pressure cooker. I just liked the idea of slow cooking it and it was fabulous! Malini, I don't have links for the Arabic versions as they were part of the research I did for this post, which is now over 4 years old. I would recommend doing a search on Google. This Hyderabadi version, which I got from Nabeela, does not use tomatoes. I do remember that the Arabic versions did not use yogurt, had veggies but also had meat. A lot of the flavor comes from the juices of the meat. know I'm not helping much and I do apologize about that! Hi, can anyone tell me if we can make marag with Beef? I want to try it this weekend so any quick responses will be highly appreciated. Hi Manisha, Did you ever get around to making the marag with some of the modifications suggested by Faraz? I am planning to try it and am wondering whether to incorporate some of his suggestions. Thanks! Cornycopious, I did! I thought I had added my feedback but apparently not. I preferred Nabeela's version. It's soupy and deeply satisfying. I did not use bone-in lamb but I can definitely see how that would add to the flavor! I used almonds, no pistachios and no cream. I stayed with yogurt. Ghee always tastes better so if I were to change anything I would use ghee instead of olive oil and use bone-in lamb, which is hard to find (for me) without being ridiculously expensive. As it is, the lamb shoulder that cost $15 in 2006 is about $35 or more! Thank you, Manisha for responding so promptly! I wasn't planning on adding cream either, but was curious about the almonds and pistachios, and the sliced versus pureed onions. I think I am going to try Nabeela's version first and maybe make changes the next time. Last question - I don't eat lamb. Do you have any pointers on how much longer bone-in chicken would need to cook? Cornycopious, chicken cooks faster than lamb so you may need to experiment with the time as I haven't cooked marag with chicken. 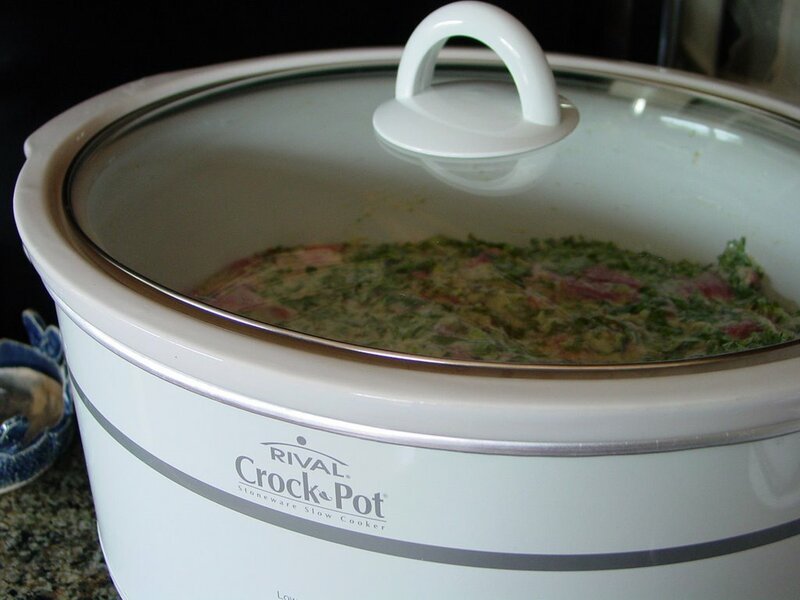 If you go by traditional slow cooker recipes where the chicken is cooked on low, it could be between 7-10 hours. Let me know if you come up with an optimal time. I'm sorry I am not of much more help than this! I've been cooking it for 2 hours now and the color is still very light. How do I make it more brown?? faddu, I'm not entirely sure what you mean by make it brown. Cooking it in a slow cooker is similar to simmering it on a stove. One hour on high and two on low has always worked for me. I don't go by the color but by the flavor and done-ness. What I can tell you is that the color is not brown, like that of a usual stove-top curry with an onion-tomato base. Nor is the texture or consistency.